It is a great pleasure to join you again at this annual meeting of the China Enterprises Association in Britain (CEAB). This gathering is also an ideal time to ring out the old year and ring in the new. 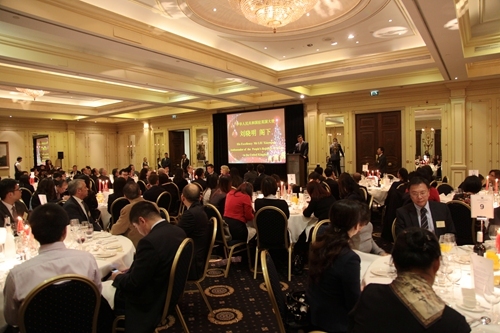 When I spoke at this CEAB New Year dinner last year, I foresaw a golden age for Chinese enterprises in the UK in 2014. I predicted that your capital will snowball, your business will thrive, and your teams will expand. As 2014 draws to a close, I would say that my predictions have, to a very large extent, come true. · The obstacle to obtaining bank branch licenses has gone. Industrial and Commercial Bank of China set up a branch in London. · China Construction Bank (London) Limited became the first clearing bank for renminbi outside Asia. · Bank of China London Branch issued renminbi bonds and underwrote UK government renminbi bonds for the first time. · Just this morning, Bank of China’s Bulk Commodity Business Centre was established. 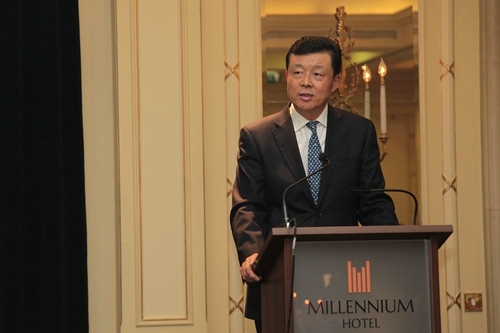 · Property companies such as ABP, Greenland and Wanda launched major projects in the UK successively. There have been also quite a number of new-comers to the UK. · Sanpower bought the House of Fraser - a business with over one hundred years of trading heritage in Britain. · And Hony Capital bought Pizza Express. I hope they will soon join the ranks of CEAB. · I congratulate you on your outstanding achievements. · And I thank you for your contribution to the economic cooperation between China and Britain. · CEAB has staged one major event after another. · The outgoing President Fang Wenjian has shown great leadership. · And the CEAB secretariat has been a superb support. · These included a business summit. · And a business gala. That was an excellent display of CEAB strength and capability. Overall this gave a powerful boost to CEAB’s image and influence. · You admitted nearly 40 new members. · You organised over 20 field trips, workshops and lectures. · And you built close cooperative relations with more than ten foreign chambers of commerce. All these developments are evidence of strong progress, broader outreach and greater authority for CEAB. So, I want to most warmly congratulate CEAB on your success. The coming year 2015 will be of great significance for both China and the China-UK relationship. President Xi Jinping pointed out at the recent Central Foreign Affairs Conference: China must strengthen cooperation with the world and, through cooperation, promote win-win results. · First, improve the efficiency and quality of outbound investments. · Second, encourage competitive industries to go global. · Third, engage in cooperation on cutting-edge technology. · And fourth, steadily advance the internationalisation of renminbi. · That you will seize the new opportunities of China’s comprehensive deepening of reform. · And you will catch the new momentum of the China-UK relationship. · and accelerate financial cooperation. You are the ones who are in an optimal position to help take China-UK economic cooperation to a new level. I also hope that CEAB under the leadership of your new President, Si Bingjun, will continue to serve as “home for Chinese enterprises in the UK”. CEAB has a vital role to help Chinese enterprises in UK. CEAB can do this by developing and strengthening cohesion and coordination among members. CEAB has high responsibility to continue to serve as a “collective name card” for Chinese enterprise in Britain. In this way CEAB provides the showcase for the positive image of contemporary Chinese enterprises. Last, but not least, I want to assure CEAB and Chinese enterprises of the continued support from the Chinese Embassy. I am confident that, through our joint efforts, China-UK economic cooperation will surely continue to make remarkable progress.